Brian Adgate is essentially a landscape painter, the objects of his paintings being a series of semi-abstract relationships between form and color in which the landscape is the binding force. There is order in his work even at its most improvised both in its structure and design and overall harmony. His landscapes are derived from the natural world, a world in which he has spent time traversing. He endeavors to regard the earth as one place waiting to be viewed and interpreted. Through his landscapes he displays and evokes nature in its many forms and colors, from the dark and varied blues of Iceland to the blistering heat infused desert paintings of Morocco and Australia where he lived and taught art for five years. Brian Adgate lives and works in the Boston area and has shown his work in galleries and museums throughout New England as well as Australia. 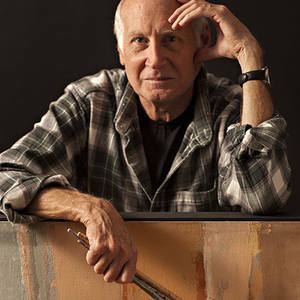 his work is in private collections in America, Japan, Australia and Europe. He currently teaches painting and drawing courses at Quincy College in Massachusetts.